Many of you have felt tired and discouraged–even bordering on hopeless. If that’s you, today’s prophetic word will bring you great healing if you’ll act on it. This last week, I spent several days (Thursday-Saturday) at Dutch Sheets’ Appeal To Heaven conference (a 3-day intercessory prayer meeting) in Middletown, Ohio. While I was there, I heard many prophetic words from the speakers and intercessors (particularly Dutch Sheets and Chuck Pierce) about what God is doing globally. I plan to share some of those words that I heard on social media (watch my Facebook page in particular) later this week. But for today, I wanted to share the prophetic word I got for you as a result of my trip. This word is not a word that was spoken at the conference; it’s a word that the Lord spoke to me yesterday as I pondered how the Lord touched had touched me during this meeting. People have been coming to me all over the place telling me how discouraged they are. And I’ve been battling quite a bit of discouragement myself at various times (although I can tell you that, after how the Lord ministered to me at this prayer event last week, I am completely healed of it and I feel totally transformed). They are feeling the effects of a great shaking that is going on in the Body of Christ. I know–when is there not shaking going on? There’s always a great shaking going on. Or at least often. If this is you, you need to pray right now that you will not be shaken off. Some shaking is of God; sometimes He uses it to purify us, teach us, and correct us. That’s when He deals with our character. It’s not fun, but that kind of shaking is necessary. However, remember also that the thief (the enemy) comes to steal, kill, and destroy. And when God shakes us up, the enemy loves to come in and hand us a big plate of self-pity. The problem is that self-pity takes us down really quick. When we get into self-pity and navel-gazing, both of which I’ve been guilty of at various times lately, we take our eyes off Jesus and the enemy gets a foothold in our souls. Beloveds, don’t let the enemy get a foothold in your soul. And if he already has one, get him off you. Quick. 1. 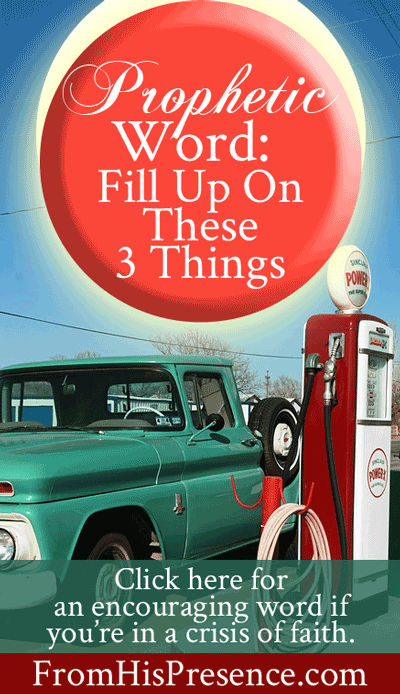 Right now, you need to fill up on who God is. How He is the Author and Perfecter of your faith. How He is weaving your storyline right now to accomplish His purposes, and how He hasn’t forgotten even one tiny detail. Do this through worship–and I mean worship that focuses on God. There are plenty of songs that focus on ourselves. They’re not bad songs. “I don’t know what you came here for, but I came to praise the Lord…” is not a bad song. But don’t use those songs. Beloved, if you’re discouraged and you’re trying to get the enemy off your back, songs about your fellow man are not going to help you. Sorry, but they’re not. YOU need to hear and sing and shout and declare the goodness and greatness and grandeur of God. Songs that look at Jesus directly. Songs that sing praises to His name. To fill up on who God is, soak in His presence right now. Soak in His Word, especially those passages about how HUGE He is. I don’t think it’s a coincidence that I’ve been battling discouragement and God’s been having me study the book of Revelation. I’ve been studying Revelation for weeks, and I can’t get away from those throne room scenes. He who is and who was and who is to come. The Lamb of God, slain from the foundation of the world–but fully victorious. Jesus, whose eyes burn with fire and whose feet are like fine brass. Jesus, who alone is worthy to open the scroll and to loose its seals. If you fill up on who God is right now, it will help you take your eyes off yourself and off your problems, and put them where they belong–on Jesus. 2. Fill up on the prophetic word. It’s SO important to be tuned into the prophetic word about what GOD is doing across the Body. I don’t mean the encouraging word from one person to another, either–although those are very important and are also needed. But if you’re struggling right now and need help getting your eyes back on Jesus, you need to hear the internationally-recognized, verified, reputable prophetic word to the nations. I received so much healing for my soul from the Holy Spirit just sitting under the prophetic word released by Chuck Pierce and Dutch Sheets about what God is doing globally. Individual prophetic words are great. We need them. But we all need to be aware that, as part of the Body of Christ, we are part of a huge RIVER of God’s work that wraps around the globe. His moves and His timing are for all of us, but if we don’t know what He’s doing, we can’t see things in their larger perspective. To keep our perspective right, we need to have a constant infilling of God’s prophetic word about the big picture–the big picture about what HE is doing and how He is winning this thing. An interesting tidbit: you know that Scripture in Romans 10:17, which says: “So then faith comes by hearing, and hearing by the word of God”? I’ve always thought that meant hearing comes from the written word of God. The logos. Meaning, if you need faith, open your Bible and read your Bible. Hide God’s Word in your heart, and your faith will grow. I looked it up just yesterday, and you know what I found? The Greek word used in that text for “word” is not logos. It’s rhema. And rhema is not the written canon of God’s Word, the Bible. Rhema is the on-time, prophetic utterance of God. Of course, this can be the same thing as God’s written Word. How many times have you been reading your Bible, only to have words seem to jump off the page at you–and you know that’s the Holy Spirit speaking directly to you? In that case, what you read is absolutely rhema. So the two–rhema and logos are not mutually exclusive. But my point here is that, if you’re in a crisis of faith, you must fill up right now on God’s prophetic word. 3. Fill up on who you are. It may sound strange to “fill up on who you are,” but you’ve got to be who you are, and you’ve got to have opportunity to exercise who you are. If you’ve ever struggled with discouragement due to lack of opportunity to practice who you are, you’ll know just what I mean. When you don’t practice who you are, the river of the Holy Spirit’s anointing inside you can’t flow. It stagnates. Also, you start to feel alone. Before this conference, I had been struggling with feeling very alone. However, at this conference, I didn’t feel alone at all. It was a 3-day prayer meeting! There were (I’m guessing) about 1,000 other people there, and they were just like me! They weren’t weird (hold your snickers, please, peanut gallery). 😉 They weren’t a bunch of crazy, spiritual-looking, weird-acting, disruptive fruits, flakes, and nuts. They were people who love God and came to pray. And for three days we stayed before the Lord to WORK. To intercede. To pray. And I was so fed and encouraged as, together, we just filled up on this thing–prayer–which is, personally, my DNA. You’ve got to fill up on who you are. Are you unsure who you are and what your DNA is? Draw close to the thing burning in your heart, and you’ll hear your name called. Hebrews 11:9 tells us that Abraham didn’t fit in. He was a stranger and sojourner, living in tents waiting on his promise. But he stayed true to who he was. And he filled up on it often–the friend of God, communing with God facedown. Moses didn’t fit in either. He was a Hebrew raised in the palaces of Egypt. But he chose to stay true to who he was, choosing to suffer with the people of God rather than embrace the pleasures of the world (Hebrews 11:25). Women received their dead raised to life again. Others were tortured, not accepting deliverance, that they might obtain a better resurrection. Still others had trial of mockings and scourgings, yes, and of chains and imprisonment. They were stoned, they were sawn in two, were tempted, were slain with the sword. They wandered about in sheepskins and goatskins, being destitute, afflicted, tormented—of whom the world was not worthy. They wandered in deserts and mountains, in dens and caves of the earth. Therefore we also, since we are surrounded by so great a cloud of witnesses, let us lay aside every weight, and the sin which so easily ensnares us, and let us run with endurance the race that is set before us, looking unto Jesus, the author and finisher of our faith, who for the joy that was set before Him endured the cross, despising the shame, and has sat down at the right hand of the throne of God” (Hebrews 12:2). Beloved, if you’re struggling right now, fill up on who God is. Fill up on His BIGNESS. His strength. The fact that HE HAS OVERCOME, and HE ALWAYS WINS. You, too, can be counted among those of whom the world was not worthy. Is the Holy Spirit using this word to minister to your heart right now? If so, please tell me about it in the comments below. I love hearing from you. Oh Thank You Abba! I have been struggling between the tension of feeling discoraged and being contrite for feeling that way, made my spirit so weary. Almost all of these references have been on my heart and in my mouth through song and prayer in the past couple weeks. Just arrived home (still sitting in my car now) and was just signing “For we trust in our God, and though His unfailing love, we will not be shaken, we will not be shaken. All those against Him will fall, for our God is stronger- He can do all things! No higher name we can call, Jesus is greater, we can do all things!” Arrived and saw this message. Studied the graphay, versus logos, versus the rhema word last summer…and the Holy Spirit has been quickening it again. How taking up the Gladius sword (used for up close, hand to hand combat Ephesians 6) of the Spirit by declaring the Rhema utterance of the Holy Spirit has power. Abba has been whispering reminders of His rhema and nudging me in the direction of these 3 areas in our secret place of worship and intercession. You just outlined them in beautiful detail and took ’em up 10 notches with extra richness (which I will be feasting on…nom nom). Let faith arise! Amen and amen. That’s another one of the prophetic words from this last weekend–Chuck Pierce said it will be important to praise our way through! I know now that I had to be shaken to give me the impetus to leave an abusive marriage. Free again. Free at last. Free finally. I’m so sorry you went through that, Mariane. But I’m glad you’re still hanging in there with Jesus. I’m so discouraged and fed up I don’t know where to start. Even if I read words of encouragement, it doesn’t help me. Start with forgiving the people whom you recently told me you were angry at, Rafael. Forgiveness is the key to getting out of unforgiveness jail. After forgiving, you’ll be able to see hope again. It’s not about being angry at people, it’s about other things. I don’t feel mad at others, but I feel sadness, hopelessness and the inability to turns difficult moments into learning experiences and feel the gift that life is. Outside the dawn is breaking, but inside in the dark I’m aching to be free. Fall is not a good season, little sun, few people around, etc. It’s a bad moment to live, I suppose. Ok, well, the reason I said that is because the other day you told me you were upset and in unforgiveness. It’s unusual for a person to have the symptoms above if unforgiveness is not present. So, I’d encourage you to ask the Holy Spirit to show you if you do have any unforgiveness in your heart, and pray through to forgive if He shows you anything. Only then can light come. I have been praying for you. You are a precious brother and God loves you very much. He wants only the best for you. And you are more than strong enough to hear His voice and follow Him. I believe you are stronger in Him than you think you are. Today is definitely one of those low days…the after effects of a shaking. *How He is the Author and Perfecter of your faith. *How He is weaving your storyline right now to accomplish His purposes, and how He hasn’t forgotten even one tiny detail. I’ve been wanting to read scripture, I’ve actually never read the book of Revelations through and that’s what I am going to do this week. Angela, I’m so glad the post encouraged you! Right at the very beginning of Revelation 1, the Lord promises a special blessing for people who read the book of Revelation and for those who hear it read. As you read, be sure to ask God for that special blessing every time you sit down! I’ve been praying for that blessing and I’ve been seeing wondrous things happen during my week! Jamie, I heard about the conference through you, and I was able to watch online, so THANK YOU!!!! I have never been so impacted through a conference before. Combine that with the Native American gathering in DC on Friday, and I believe the Lord is going to move in a mighty way. I know the shaking is coming – is already here – but I feel such HOPE now! Thank you for your encouraging words. You and your ministry are such a blessing to us. Oh Leslie, I’m SO GLAD!!!!!! that you got to watch it!!!! Yayyy!!! Yes, I believe He’s going to answer too. It encouraged me so much to see Dutch stand up at the beginning of the conference and say, “I expect to win!” Before he said that, I had been wondering if it was even possible. But after that, the Lord filled me with faith and reminded me that our faith is in GOD, not in voters!!! But we still must vote, of course! I was just so encouraged also, though. It was wonderful. Benji, I am glad the Lord is showing you these things. Sexual sin brings people down faster than any other thing except unforgiveness. I’m glad to hear that you are making the choice to repent, so that you can be free. God sees your desire to be clean, and I urge you to cling closely to Jesus and keep your eyes on Him. Become transfixed with His beauty, and allow Him to become your obsession. May God give you grace and peace in Jesus Christ today. Thank you for reading my blog, and for sharing what’s on your heart. Just went through a divorce after 40 years of marriage. Ex husband left me for a much younger woman. God shook me up. He showed me how I left Him and allowed satan to invade our lives. God gave me the word “heal” this morning and so I see the Cross before me and the world behind me. We both, ex husband and I, made mistakes. Ex husband took our problems outside of marriage. But Hif allowed me to see my errors too. God will heal each of us and our marriage. I must keep my eyes on the prize and that is Jesus Christ. Thank you for reminding me how Big my God is. He is truly Supreme and loving. Carolyn, I’m really sorry you’re going through that, but I’m so glad to hear that the Lord is talking to you about it and bringing you into a time of healing. I prayed for you just now. Getting out of this is going to require total forgiveness. But you can do it. Ask Holy Spirit for help and He will help you. Wow. All I can do is cry right now after reading all your encouraging heartful of the Spirit words! All ministering to me and even the Kim Hill song. I am speechless. Felt so alone and like giving up. I am a writer and a speaker and a teacher but have had to come to this place in my life through health shaking revelation. Now after arising, I have been crying out to God asking for direction and ran into your email today. I am simply filled with hope again that God has not forgotten about me! Your work is everything he has been speaking to me about and I just didn’t know how to find my way. Please pray for me that he will take me to the next season without distraction and that I would obey and follow his instructions to fulfill his intended purpose for my life on earth for his glory. Thank you for your surrender and willingness to freely give and minister to me and many others who will read your writings. Blessings. Jamie…God bless you for touching lives. I am so discouraged right now, and so shaken, I prayed, prophesied, believed, I did everything but I couldn’t keep the job I had been so opportune to have. Why did I get it in the first place if it wasn’t meant to be mine. I don’t understand, now I can’t even pray and I feel so betrayed. I can’t read my Bible. why does God have to make me go through such just to teach a lesson. Is that fair? Hi Brenda. I don’t understand either, dear heart, but Father knows best. We don’t know that Father caused you to lose your job, but we do know that He is GOOD. So if He did remove you from the job, it was to protect you. We don’t know what could have happened that He might have been protecting you from. Or, if the devil stole your job but Father allowed it, He only allowed it because He has a much BETTER job for you. So I pray right now that Father God would work this out for your good (Romans 8:28), and that He would lead you to the much BETTER job that HE has for you, and provide for all your needs at this time. Beloved sister, I’m sorry you’re upset and that you’re going through a hard time. But Father is so good and loves you so very, very much. He will perfect all things that concern you. (Psalm 138:8). Please seek Him and confess your heart to Him. Pour our even your anger to Him. (He knows already, so He will not be surprised.) He loves you and He will help you through this. He is the Friend who sticks closer than a brother. Grace and peace to you today, dear. I will be praying for you. Oh and by the way, Brenda, in addition to the below, I wanted to share this song with you that I thought might bring you comfort. If you’d like to listen! Jamie, I thank you for this word. I have been feeling down a lot latley. I dont know what was wrong. I been praying. But it seem like God wasn’t with me. Or sometimes I didn’t even wanted to read my prayers. Now I know what was wrong with my spirit. I thank God for you and this Rehma word. I am praising and loving on him right now. You are truly my Angel. I thank you again.